Political Islam did not really play a prominent role in the success of the Tunisian revolution. Islamists were notably absent from the protests and the revolutionary slogans were about freedom, dignity, and jobs rather than Sharia law or the creation of an Islamic state. This made it reasonably easy for Europeans and Americans to support the Tunisian uprising, as it looked surprisingly non-threatening to the West. In fact, the Tunisian protesters seemed to have much in common with their European and American counterparts involved in demanding more accountability from their own political elites. 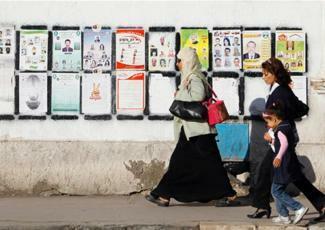 The October 2011 elections, however, offered a different and surprising, at least for some, picture of the country. The Islamist party Ennahda became by far the dominant political movement and now leads a three-party government coalition together with two secular left-leaning parties. This means that former Islamist political prisoners and exiles are today in power. Ennahda’s landslide victory contradicted the assumptions of many analysts and scholars about Tunisia, which was believed to be a haven of secularism in North Africa, thanks to the modernizing policies of both Bourguiba and Ben Ali. If the electoral strength of Ennahda was not enough to question the effective penetration of Tunisian elite-led secularism in society, the very public emergence of Salafism certainly did the trick. Since the departure of Ben Ali, Salafism has acquired a public presence in urban centers, with Salafists from a variety of different movements involved in numerous high profile incidents: holding demonstrations against blasphemy, targeting films and art exhibits, or challenging dress-code regulations in universities. While the actual number of Salafist activists is relatively small, their highly mediatized activities have placed Salafism at the center of both political and scholarly attention. It is this phenomenon, too easily stereotyped, that deserves analysis. In particular, the crucial question of the provenance of these Salafists forcefully arises given the reluctance to accept that they are the product of the domestic Tunisian reality. Thus, the francophone press both in Tunisia and France has been covering what they call the “Salafist danger” or the “Salafist cancer,” as if the phenomenon were an aberration in Tunisian society and a significant threat to the construction of a democratic political system. When one looks at the different Tunisian Salafist movements, there are two points that emerge and are worth analyzing. First, far from being simply an externally-generated political phenomenon, Tunisian Salafism has strong domestic roots. Second, and quite paradoxically, the public presence of Salafism might generate a democratic and liberal backlash that could strengthen social and political pluralism in the longer term as large sectors of society mobilize against illiberal and anti-democratic forces. In addition, operating within a more democratic and liberal framework might change the way in which Salafists relate to the state. As mentioned above, there are different strands within Salafism that are present on the Tunisian public scene. Broadly speaking, there are two large families within Salafism: scientific and Jihadi. The crucial difference between the two families is over the use of armed struggle to attain political objectives. Within scientific Salafism in Tunisia there are groups advocating political engagement and acceptance of democracy within the confines of Sharia law (Jabhat al-Islah) and groups involved in preaching a purist version of Islam (dawa and Wahhabism-influenced groups). It is, however, Jihadi Salafism that has attracted most attention. In particular, more recently, it is the issue of Tunisian Jihadi fighters in Iraq that has surfaced in the press. Far from simply being treated solely as a security issue, the debate over the fate of Tunisian fighters in Iraq generated intense debates about the history of Jihadism in Tunisia, its validity as a form of political expression, and the role that it plays in the currently volatile politics of the country. Far from being a recent foreign import, Tunisian Jihadism has its historic roots in the dissatisfaction of some Islamists with the political thinking and strategies of the 1980s predecessor of Ennahda: the Mouvement Tendence Islamique (MTI). A radical wing of the MTI splintered from the party to create the Tunisian Islamic Front (TIF) in 1988. Mohammad Ali Hurath, Abdallah al Haji, Mohammad Khoujia, and Mongi al-Hachmi are the founding members of the group, which operated in Sfax and Tunis. The group had a very limited influence on domestic politics and due to the repressive policies of the government, some of its militants left Tunisia for Peshawar where they took part in the Afghani jihad. Other militants went into exile. Ali Hurath, for instance, found refuge in London after a long period between Algeria, Pakistan, former Yugoslavia, and Germany. In the UK, Hurath eventually became general manager of the “Islam Channel” television station. On the air he delivered fiery and radical speeches, leading the authorities to accuse him of incitement to religious extremism. After the fall of Ben Ali, Hurath negotiated with the new Tunisian authorities to allow his return to Tunis in order to establish a political party, which would run in the 2011 elections. At the same time, he stated that a number of militants had been freed from Tunisian jails and were ready to return to the public scene. The permit to set up a party did not arrive at that stage because the transitional authorities did not place any trust in the democratic commitment of any form of Salafism. However, Jabhat al-Islah was eventually legalized on 29 March 2012, possibly because Ennahda, by then in power, vouched for its commitment to democratic procedures. In the month of May of the same year, the party was formally presented to the public during a ceremony attended by a number of prominent religious figures and, crucially, Rachid Ghannouchi, president of Ennahda. The president of the first legal Salafist Tunisian party is Mohamed Khouja, who had been a prominent member of the TIF in the 1980s. The legalization of this Salafist party indicates two important developments. First, Jihadists of the older generation, like Hurath and Khouja, preferred from the beginning of the post-revolutionary period to fall within the camp of scientific Salafism and to work within the nascent institutions, despite having major reservations about liberal-democracy and pushing the boundaries of legality with their activities. Thus, the older generation of Salafists seems more attracted by the prospect of participating in institutional politics rather than continuing with street politics. Second, the presence of Ghannouchi at the official presentation suggests that the strategy of engagement Ennahda pursued with sectors of Salafism, to encourage them to pursue their goals thorough the new institutions of the country, has been somewhat successful partly because of the personal relations that the older generation of Islamists have with each other. The problem, however, for future developments in Tunisia is that many of today’s Tunisian Jihadists and Salafists do not really recognize Jabhat al-Islah as their natural home because they draw their ideological and political inspiration from other events and political or military experiences. The Palestinian Intifada and the war in Iraq have been the formative experiences for the younger generation of Salafists, and the Jihadist ones in particular. Palestine is still a profoundly important mobilizing issue for Jihadi Salafism from an ideological perspective insofar as it seems to confirm the injustices perpetrated against Muslims, although there is no active participation of foreign Jihadis in Palestine. The war on Iraq, however, has been an actual formative terrain of armed struggle for foreign Jihadis attracted to fighting Americans violating Arab lands. In this respect, those analysts who had predicted that the war in Iraq would generate a Jihadi front across the Middle East and North Africa have been proven correct. It is the war in Iraq that has become central for many young Tunisians. Linking up with Tunisians who had fought in Afghanistan, Bosnia, and Chechnya, there was a concerted attempt since the mid-2000s by Jihadists outside of Tunisia to create a presence in Tunisia itself in order to combat the illegitimate regime of Ben Ali because of its kafir secular nature. The architect of this attempt is Lassaad Sessi, who had resided in Italy for a long time. In April 2006, Sessi and a small group of armed Jihadists crossed the border from Algeria into Tunisia and participated in a gunfight with the Tunisian security forces. Having escaped the security forces, Sessi managed to recruit a few young militants in Sousse, Tunis, and Sidi Bouzid. What is surprising is the relative ease with which such a recruiting campaign occurred, given the supposed insularity of Tunisia from extremism and the omnipresence of the security apparatus. All the young people recruited into Jund Assad ibn Furat were under the control of the security services because of their assiduous frequentation of mosques and because of their physical appearance and attire. They were continuously brought to police stations for questioning and then released. They were suspects, always under pressure and socially marginalised in the sense that police attention meant unemployment. This continued pressure made deeper involvement with the Jihadi movement almost natural. (An-Nadhif, op.cit.). Young people did not have much of a choice. Some of them retreated into personal activities with no political significance, others replicated the consumerist behaviour of their western counterparts, and some found a refuge in extremist views of Islam that led them on the wrong path. The blame for this has to be squarely on the regime. (Interview with FC, co-author). While the young Islamists of the 1970s read a considerable amount of political theory, had long discussions, and shared loci of decision-making; the religiously-oriented youth of the 2000s lived in almost complete isolation, had no contacts with the leaders they referred to, and displayed forms of behaviour that they had quickly downloaded from fatwas taken on the internet. (Interview with FM, co-author). The international situation contributed to further radicalization. In part, this explains why this Jihadi Salafism oscillated between violence and peaceful means, notably preaching. The young militants were isolated from each other physically, and united only through a shared spirituality found on the internet and linked by the great Arab causes of the decade: Palestine and Iraq. There were physical places where militants met in Ben Ali’s Tunisia, such as the “campus” and the Malek ibn Anas mosques (Interview with Youssef Nouioui, member of Ennahda, interview with FM, co-author), but they were under surveillance given the autonomous ideas of the imams preaching there, who chose to ignore the sermons distributed by the state. The fall of the regime changed everything for Tunisian Salafism. One of the first events to occur in post-revolutionary Tunisia was the liberation of political prisoners, including the Salafists. Their liberation, coupled with the return of Jihadi exiles and with the emergence of new recruits, created the necessary synergy for the arrival on the political scene. By April 2011, the group Ansar Ash-Sharia was formed. Ansar Ash-Sharia is the most important Salafist group in the country today and a year after its creation it keeps growing, as demonstrated by the mass rally in Kairouan to celebrate its first anniversary, attended by thousands of people (variably estimated at between 5000 and 15000). The group rejects democracy as being extraneous to the teaching and the “living” of Islam and therefore concentrates its effort on the dawa, making it more difficult to categorize it as a Jihadi group at all. Preaching and non-adoption of armed violence means attempting to exercise a degree of control over society and the behavior of individuals in order to reinforce social mores derived from what the group refers to as “the straight path of Islam in its strictest interpretation.” First, the group organized “occupy mosques” campaigns whereby imams who were accused of having been too loyal to the regime were chased out. Second, significant attention was given to the issue of Tunisian prisoners in Iraqi jails and their plight in detention. The group organized advocacy campaigns and lobbied the Tunisian government to intervene on their behalf. Family members of the Tunisian prisoners in Iraq set up a non-governmental organization to highlight the issue. Finally, they organized campaigns to defend religious symbols, to make blasphemy a criminal offense, to introduce gender segregation in public spaces, and to encourage charitable activities. The way in which the group operates is structured around the intellectual framework provided largely by sheikh Khatib Idriss, a Tunisian ideologue of Jihadism who argues that “those who eliminate jihad from the tools with which the message of Islam should be propagated are not Salafist because they eliminate a pillar of Islam…and as Muslims we have to accept Islam in its entirety.” In this respect, “the Jihadi Salafist is different from other Muslims because he is coherent with the whole of the revelation and refuses to dilute it in order to become a moderate simply to appease the government or the unbelievers” (Nasser Hiddouri “I movimenti islamici in Tunisia”, MA thesis, University Orientale, 2010-11, Napoli, Italy). The activities undertaken in the name of Islam and outlined above are not part of the instruments that political parties or movements utilize, but simply a way of life that strict Muslims should follow in order to propagate “this correct interpretation of Islam, purifying the religion from innovations” (Hiddouri, op. cit.). Our instrument is preaching, in other words the spreading and teaching of Islam in a peaceful manner. We do not wish to make war on anybody because the term jihad does not exclusively mean fighting, but it is also the struggle to propagate the message of Islam through the dawa, through participation in the solution of problems, although in the confines of sharia law” (Hiddouri, op.cit. p.43). Calling for the form of jihad understood as fighting is not yet an option for the current generation of Salafists, making it more problematic to place them into the Jihadi category. It is well known that the group considers the current government hostile to Salafism, but at the same time it cannot be considered an enemy to be fought through an armed struggle, since it has yet to prevent the teaching and the dawa of the Salafist groups. This is a rather novel situation for Salafism in the sense that the freedom of the social and public space is very significant and the Salafists are forced, in some ways, to recognize the benefits of operating in an environment where they can work in society as they please, despite the fact that the country is run by Muslims “who no longer practice and live the real religion.” Conversely, the government, and Ennahda in particular, tend to leave Salafists alone in their social activities to the point that the secular sectors of society argue that the hand of the Salafists is too free and interferes with the construction of an open and pluralistic Tunisia, devoid of religious extremism. The national and international francophone press airs these views often in its coverage of Tunisia. In conclusion, there are a number of interesting points that can be made about the arrival of Salafism on the Tunisian public scene, which goes beyond the effective number of its followers and its different forms. First, and contrary to what many in Tunisia have contended, Salafism is not an externally-generated phenomenon. It appears quite clearly that such forms of political and social engagement, however marginal, have been present in the country for two decades and despite interacting with international Salafism, it has roots in Tunisia. The fall of the Ben Ali regime has simply allowed militants and activists to operate in the open. Second, there are no doubts that there is a linkage between vast sectors of Tunisian Salafism and the brand and ideology of international Jihadi Salafism. For instance, Abu Ayadh, the emir of Ansar Ash-Sharia, fought in Afghanistan. While there might be no direct structural linkages, both leaders and ordinary activists declare without many problems their allegiance to the symbols of the international jihad. This, however, has not meant the import of armed violence in Tunisia. Third, Tunisian Salafism is in a process of structuralizing in an atmosphere of liberty and freedom that bears no comparison with the rest of the Arab world. Such an environment is a double-edged sword for Salafism. On the one hand, the vast majority of Tunisians considers the views of the Salafists extreme, and some of them call on the government to crack down more forcefully on Salafist groups, given that they are often accused of violent intimidation. In this respect, the possibility to freely proselytize is a boost for the Salafists and a problem for others, but this has to be accepted in pluralist society. On the other hand, and probably more significantly, Salafism finds a significant obstacle to its activities because of the capacity of Tunisian society to mobilize strongly against it. In a way, Tunisian Salafism finds itself having to manage the costs and the benefits of operating within a nascent liberal-democratic framework that it ideologically opposes. Some groups, including the Party of Reform, have come to terms with democratic procedures while remaining critical of extensive liberal rights. Others wholeheartedly reject liberal-democracy, but are still unclear how far they can go in trying to set up an alternative political system in place. It is very difficult to predict what the future holds for both Tunisia and Tunisian Salafism, but the political institutionalization of the Salafist phenomenon is still a possibility. After all, the use of violence has not yet occurred despite the tensions that have characterized the political debate over the last eighteen months, with Ennahda trying to demonstrate its resolve in dealing with Salafist disturbances and over-the-top campaigning and activities. In any case, what is going to determine the way in which the Tunisian revolution will evolve largely depends, according to Sami Braham, “from the socio-economic element…the ability of the political institutions to respond to the enormous expectations of the population, particularly its poorer sectors, in terms of employment and economic growth” (Interview with FM, co-author). The Salafist youth reminds me of my youth and the relationship we had with the extremism (secular, in this case) that Bourguiba displayed in the 1970s. The 1990s produced a second generation of angry young men because of the absence of Islam in society. The 1990s were catastrophic for religion: the mosques, having become centres of praise for Ben Ali, were deserted; theology books disappeared from libraries. There were no girls with their heads covered…The children of a number of Islamist activists have become Salafists! This is a generation that was born with their fathers being absent and has grown up listening, like a litany, to stories of torture and suffering. The only references that unfortunately they found were religious channels from the Gulf, with a strong Salafist message. However, I am convinced that in ten to fifteen years Tunisia will be able to welcome back the Salafists just like it did with the Islamists of my generation who have been reconciled with moderate indigenous Islam. The ability of this country to tame the toughest plants is quite incredible! (La Presse, 31 July, 2012). One can disagree with the assessment of Salafism that Ghannouchi puts forth, and many secular Tunisians would certainly not subscribe to the view that Salafism can be reconciled with a liberal and democratic Tunisia, but liberal-democracy and its workings might in time weaken Salafism to the point of accepting and working within the nascent institutions. Posted on August 20, 2012, in North Africa and tagged Islamists, Salafists, Secularist Movement, Tunisia. Bookmark the permalink. Leave a comment.